While researching Samuel Baskin Hathorn, former owner of my Hathorn family, I have found a lot of information that I will sort through over the next few weeks and months. Samuel Baskin Hathorn was born in Ireland and immigrated first to South Carolina and then to Georgia and finally settled in Mississippi in 1818. I was performing look-ups and typed in the name Samuel Hathorn without birth date information and found the WWI draft card for Samuel Hathorn, born 1894, Black. Of course I checked my database and there was Samuel Hathorn, the 10th of 11 children born to William and Harriet (Loflin) Hathorn. William Hathorn, Sr. had been owned by Samuel Baskin Hathorn. As I looked through the list of my Hathorn names, I am seeing the same names appear throughout the generations between the White Hathorns and the Black Hathorns. My second great-aunt’s name is listed as Zana and one of Samuel Baskin Hathorn’s wives is named Susannah. There are Matildas, Williams, Jacks and Janes on both sides. It is very confusing to research the family and I have seen family trees that have records for my Jane Hathorn attached to White Jane Hathorn. Simply a matter of common names of the era on both sides? I don’t yet. 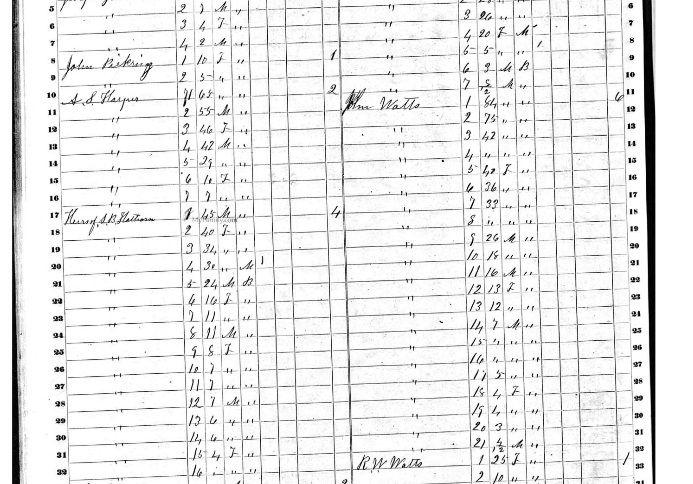 This is the listing for SB Hathorn on the 1860 Federal Census – Slave Schedule. Slaves Schedules always frustrate me. A collection of ages, gender, race and a lot of guess work on my part. I draw a conclusion and then try to track down supporting information. Thankfully, I have almost decoded this listing for SB Hathorn. x F Black – I believe this is Little Isaac as explained in the Estate Record of SB Hathorn and that F was incorrectly notated. I’m waiting for additional film that I won’t have access to until after the holidays. There should be a case in Covington County that explains why my Hathorns couldn’t be sold. And since I’m waiting, I’ll try to track down the other slaves belonging to SB Hathorn. I’ll also begin plotting SB Hathorn’s life to locate additional information about Mahala. I once thought this journey was near impossible but I’m beginning to think that it can done. Finally, I received a roll of film of Probate Records from Marion County, MS. There was a notation in a book of abstracts of wills from Covington County stating that SB Hathorn had died intestate and that additional documentation could be found in Marion County. I was hoping for a mention of my 3rd great-grandmother, Mahala, in the documentation. I was so excited to find not only Mahala but there is Bill, who is my 2nd great-grandfather. I will spend this afternoon cross referencing data in the 1850 and 1860 census with the names found in the estate of SB Hathorn. Boy Jim sold to SJ Harper, Jr. The Hill family loves to eat. The holidays only gave us an excuse to gorge ourselves without guilt. There were the holiday get-togethers. These were small events where we usually had ribs and macaroni and cheese with a variety of snack foods. I liked these little parties because my mom made my favorite party food – shrimp dip with crackers. My Birthday – I was born on Christmas so in order for me to feel like I wasn’t missing a birthday just because it was Christmas, I had a birthday cake. This was usually something with lots of frosting and candy flowers and chocolate ice cream. Just thinking about those days, makes me feel over full. Today we still enjoy eating but we have fewer parties and fewer gorging opportunities. That probably has something to do with the fact that my husband and I don’t cook. I am up way past my bedtime this evening measuring the size of rock candy. It’s a science fair project for my procrastinating daughter. While I was waiting for the alarm to go off to signal the final measuring of the evening, I decided to input some information about Isaac Hathorn. Isaac is my 3rd great grandfather, the husband of Mahala. I have no idea what any of that means except that at some point the Hathorns owned some land! I discovered something else that I need to study and make a note to ask my Hathorn cousins if anyone lives on this land today. Could it have been where the “old house” was? The “old house” was a place referred to by my dad when he tells us about courting my mother. Each Thanksgiving Eve, my mother and great-aunts would crowd into the kitchen and begin baking. They made cakes, pies and cornbread for dressing. My brothers and I would crowded at the counter with a spoon waiting to lick a mixing bowl. Thanksgiving was always a great meal prepared by great cooks. Then there was the Thanksgiving that Cousin Alma came to visit. I don’t yet know the exact relationship of Alma Hathorn to my grandmother and her sisters. She was called “cousin” and she lived in Prentiss, MS. For some reason that I don’t remember, Cousin Alma came to our house in Jackson, MS for Thanksgiving. In sharp contrast to my grandmother, she was a quiet woman who smiled without showing any teeth. My grandma had a loud rolling laugh! She was sharp-tongued and sharp-witted. I remember that my grandmother talked and Cousin Alma mostly nodded assent. If Cousin Alma disagreed, she would shake her head and say, “Now, Thelma”. Also in sharp contrast to my grandmother, Cousin Alma could cook. She was famous at Mt. Carmel Church for her jelly cake. This was a sponge cake with a jelly filling. She rolled the cake into a log and spread homemade icing over it. It was the most delicious non-chocolate dessert I’ve ever had. She made this for our Thanksgiving. She also made an egg custard which has set the bar for all egg custards that my brother, Stacy, has ever eaten. That year, she taught my mother how to make red velvet cake and we were all in heaven. My father can never remember her name, but routinely he mentions “that woman who made the cakes that year”. I will remember Cousin Alma always. The sweet quiet woman who was such a fabulous baker that she impressed a family for over 30 years. I needed to get reorganized in my search for Mahala Hathorn. 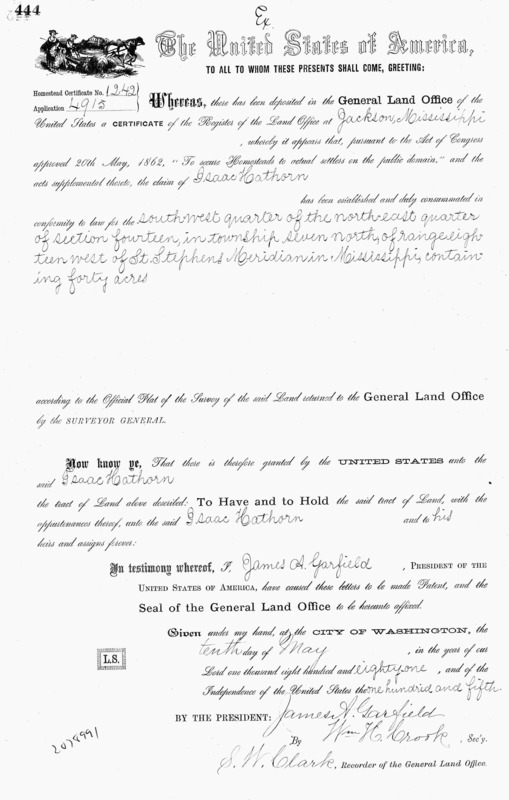 I had gotten sidetracked with other family searches and writing about genealogy. Mahala was still as she was at the beginning of the year – a labor contract with unidentified persons signed with N.C. Hathorn. So I set about this past week to review her information and revise my research plan. Sidetracked again – a clue about Zana Hathorn. An alert on my Family Tree Maker dashboard showed that someone had linked the 1870 Census for Zana Hathorn to Zanie Hawthorne in their family tree. I tried not to click the link. I knew where this was going to lead. A little background – Zana Hathorn was listed in the 1870 census in the home of Isaac and Mahala Hathorn. She was 17 at the time. I had been unsuccessful in finding her after this census. I also knew that in 1900, Mahala and Isaac would be the caregivers for two children – John and Anna Holloway. The three candidates for their mother were – Zana, Ann or Matilda. Clicking the link – Zana Hathorn was listed as being married to Henry Thomas. She was found in the 1900, 1910 and 1920 census in Lawrence County. Still missing though was information about her whereabouts after 1870 to 1900. Per one of the family trees, Zana Hathorn had children prior to her marriage. I then went to the Lawrence County Enumeration of Educable Children found on Familysearch.org and found her in 1892 with 3 children – Lear, Vandy? and Willie. Willie Hathorn would become Willie Thomas. The other two are still unknown. Making the decision – I have decided not to follow Zana for the moment. I have written her here so that I will not forget and plan to revisit her next year if I have finished with Mahala. So till next year, Miss Zana Hathorn. As I put the final touches on my presentation for the AASIG meeting, I was preparing my conclusion slide and there were bullet points about handling sensitive information. I felt, though, that something was missing. This presentation was also about the research process. In my efforts to find my grandfather’s family, I searched the same records over and over again because I was looking for what should have been there based on family tradition. I didn’t let the evidence lead my research. My first mistake in the process was the initial family Bible entry. My grandmother had written that the parents of LC Hill were John Lacy Hill and Rosie Sampson. On the next line she had written her parents as James Wright and Sallie Seals Wright. Notice the difference in the notation? I didn’t until later. I should have questioned the difference in the name of the wife. As I looked over other of my grandmother’s records, a married woman is always written with her maiden and married name. In the case of a cousin born before his mother’s marriage, his mother is listed with only her maiden name and the full name of the father. I didn’t pick up on grandmother’s subtle way of saying that there was not a marriage. 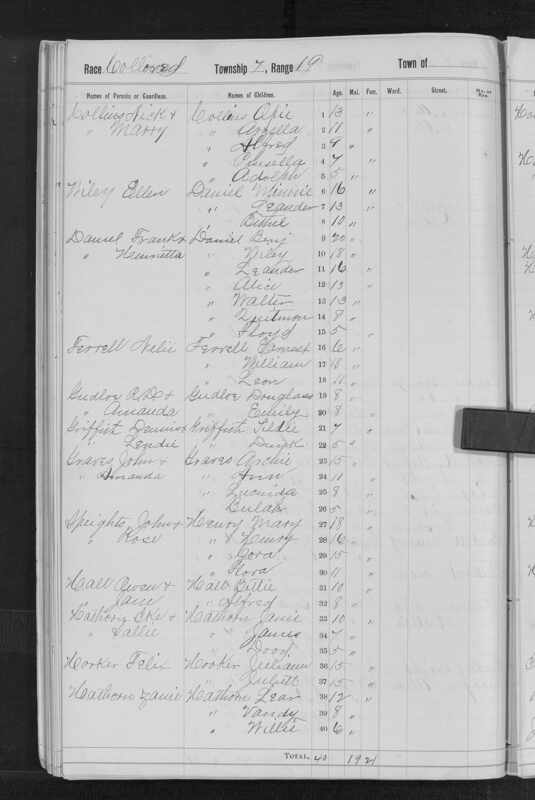 In my census research, I was so caught up in looking for an intact Hill family, that I didn’t look for individuals. Had my initial census search involved an individual rather than a family unit then I wouldn’t have missed the 1900 census showing Rosie Sampson living in the home of John Lacy Hill. In the end, I of course realized that there were two families of John Lacy Hill one legitimate and one illegitimate. I added to my presentation that researchers must be unbiased in their research and in their conclusions. Yes, some family traditions may be proven inaccurate. However, the truth is far better for future generations than continually perpetuating misconceptions. I’ve chosen the subject of my talk on September 17, 2011 for the African American Special Interest Group of the Dallas Genealogical Society. I will be speaking about John Lacy Hill and how to delicately handle family secrets. Our family tradition holds that my grandfather’s father was John Lacy Hill. My grandfather’s SS-5 letter, delayed birth certificate and death certificate affirm this. I also have the death certificates of Granddaddy’s sister and two brothers listing the same set of parents – John Lacy Hill and Rosie Sampson. Sounds pretty cut and dry, right? Well here’s the thing. John Lacy Hill was married to Ellen Edgar at the time. He and Ellen had several children of their own. And another thing, our family’s surname was recorded as Sampson in the census records and the Educable Children’s Listing. Breaking the news – I originally shared this information with my dad and my aunts and uncles. They told me that I had to be wrong. They always knew the names of their grandparents. But they admitted that they had never met their grandparents or knew anything about them except their names. They also admitted that they had never met any cousins with the surname – Hill. Reaching out – Eventually, my dad and aunts and uncles came to believe my version of the two families of John Lacy Hill. Armed with confidence, I went in search of the Hill family. I was looking for the parents of John Lacy and met a researcher who was related to John Lacy. Again, I was told that I was wrong and that I must be looking for another Hill family. I thought, really? It’s been a hundred years, can’t we just look at the evidence? Going it alone – At this point, I have moved past the “outside” family stigma and am researching my Hill roots. It’s hard to show in a database, but I continue on. I am still searching for other Hill researchers to share information. If you know any with ties to Oktibbeha County in Mississippi, feel free to share with them.